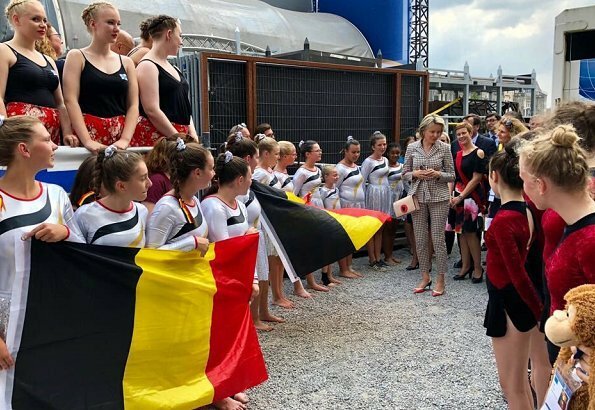 On July 17, 2018, Queen Mathilde of Belgium visited the Eurogym 2018 International Gymnastics Festival in Liege. EuroGym is one of the biggest gymnastics events specifically for young people aged between 12 and 18 years. A non-competitive festival event, EuroGym takes place every two years, the objective being to unite young European gymnasts, providing the opportunity for gymnasts to perform their team display routines on an international stage. Just the right outfit for this event. That is very checkery. Hurts the eyes. Too much going on here. Maybe would have better just with choice of either checked pants or checked top but not both. I completely agree. A neutral top or trousers would have not been so busy looking, Cute shoes and purse! Generally I like Mathilde's outfits but this is hideous! The pattern makes her legs look fat, the trouser length is odd, the belt on the jacket makes her look fat. Bin it! That's quite a bold check for a whole outfit but I think she carries it off. I think this suit is too close to the body and would look better if it were hanging more gracefully. The pants are too short, also, so the whole look is that it is too small for her. 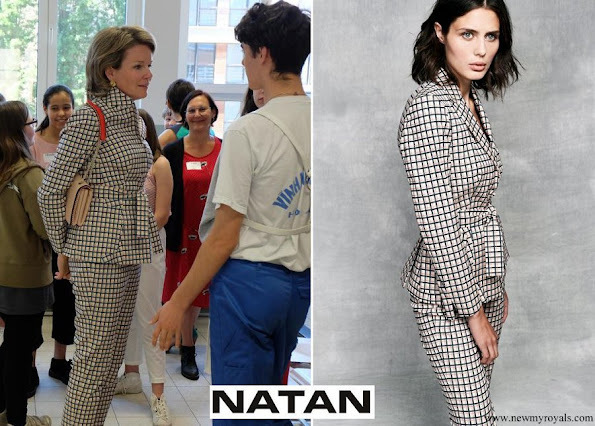 Mathilde has had so nice clothes lately but this suit is total failure. 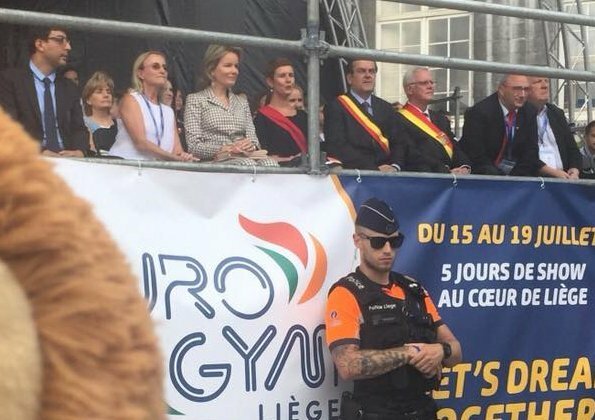 Queen Mathilde of Belgium looks fabulous. Trying to make the balance between the excessively negative comments and the one of Yumiko, I would say : suit looks nice on the model but not really on Mathilde, top or bottom should rather be plain colour for her. I like that Mathilde is not stiff and has some fun (as appropriate) with her her fashion choices. 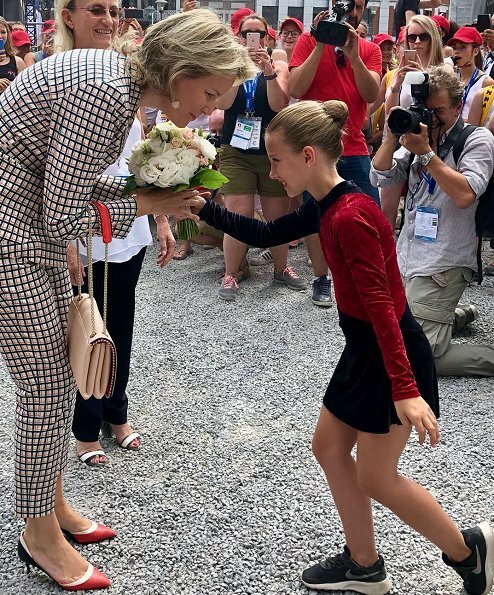 She never wears stiff, so-called regal outfits when on engagements involving children. 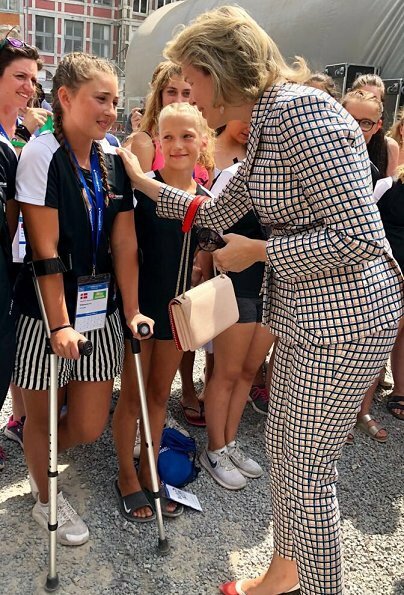 This is an outfit that makes her approachable and combined with her warm, genuine smile, makes her like anyone's mum, rather than some distant figurehead. And it also fits her well. So it's a win by me.